An otherworldly energy runs through the city of Savannah, belying its sleepy, moss-cradled charm. The old, beguiling streets look welcoming to most . . . but certain families know what lurks under their genteel surfaces. Families like Mercy Taylor’s, which has the most powerful lineage of witches in the South, know this all too well. Mercy and her husband, Peter, are happily preparing to welcome baby Colin into their lives. But their excitement quickly becomes overshadowed by a gruesome discovery: someone has scattered severed limbs throughout the city. After a troubling visit from an old foe, Mercy learns that dark magic is at play, and someone—or something—wants her and her unborn child out of the picture. To uncover the shocking reason why, the amateur witch must face a force beyond her power . . . or risk losing everything. The third book in J.D. 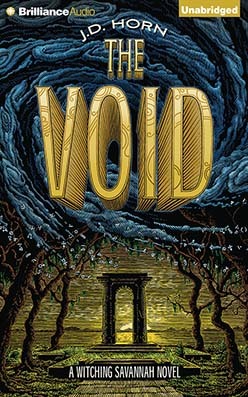 Horn’s Witching Savannah series, The Void is a gripping adventure about the enchantment—and evil—that can lie just beyond sight.